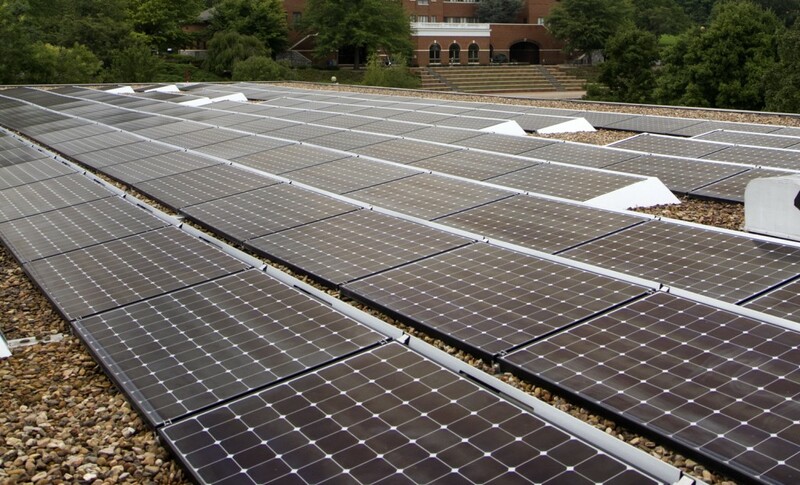 The solar array on the roof of the EMU Library was the first in Virginia to exceed 100 kilowatts in capacity. The system exceeded its performance goals for the period of January through June 2012 by 118 percent. Photo by Jon Styer. Sunnier-than-expected days over the past six months have led to Eastern Mennonite University’s solar power system soaking in more energy than anticipated. During the first six months of 2012, the 126,000-kilowatt-hour system performed 18 percent over target, meaning it actually brought in closer to 150,000 kilowatt-hours of energy, according to officials. The system, located atop the Sadie A. Hartzler Library, provides about 2.5 percent of the energy the Harrisonburg campus and its approximately 1,500 students consume. The 126,000 kilowatt-hours the system produces is equivalent to 1.26 million 100-watt light bulbs burning for one hour, said Anthony Smith, an assistant professor of business at EMU and CEO of the company that owns the solar array, Secure Futures. But, since being installed in November 2010, the nearly $1 million system has consistently overshot its 126,000-kilowatt-hour annual target, meaning the university will help Secure Futures pay off its purchase of the system more quickly. EMU was able to install the system on campus as part of a 20-year power-performance contract with Secure Futures, a Staunton-based solar energy development company. The company owns and operates the system and EMU pays the company for the energy produced at a price equivalent to the rate the university pays its traditional energy provider, Harrisonburg Electric Commission. According to Daryl Bert, vice president for finance at EMU, the university spent about $460,000 on energy during the fiscal year that ended June 30, about $18,400 of which went toward solar energy. EMU paid in advance for 10 years of the guaranteed output of the system. The university will pay for additional kilowatt hours produced by the system; if the system underperforms, Secure Futures pays EMU for the difference between what had been projected and what’s actually produced. The partnership is beneficial to EMU, Smith said, because it helps the university increase campus sustainability efforts. Secure Futures will make money from the partnership after the initial setup costs are paid off in 10 to 12 years. Because EMU is locked in at a certain kilowatt-hour rate with Secure Futures, a cost savings can be realized if utility rates climb in the future. “We expect that the utility rates will increase at a more rapid rate than what we’re selling power to the university,” said Smith, who declined to provide the agreed rate between Secure Futures and EMU, saying it is a confidential contract. The opposite statement could also be true, however, if utility rates dropped. For 2011-12, based on EMU’s 5.7 million kilowatt- hours used and total energy costs, the university paid approximately 7.9 cents per kilowatt-hour for the campus’ energy. Although the university would be relieved from regular utility rate increases, the contract between EMU and Secure Futures does have an “escalator clause,” meaning the rate charged will increase at a predetermined rate. That clause is typical of power-purchase agreements, Smith said. Installing the system, which was the largest in Virginia when it debuted in 2010, was a forward step for EMU, Smith says, in a state not known for having the most solar-friendly policies. “If we weren’t working with an institution who wanted to be a leader in energy efficiency, it would have been a much more difficult sell,” he said. The city also has taken steps to encourage more solar energy projects. In 2011, Harrisonburg City Council approved a 100 percent tax break for 20 years on tangible personal property related to the development of solar energy. The exemption, retroactive to July 1, 2010, was designed to encourage more solar-energy development.